I am so. flipping. glad. the dog is gone. You already know my pet “injury” story and how it ended, so, yeah. No rescue dog. And kisses to poor Wink. @Ashleigh Baker, Your story was in the forefront of my mind from the moment I walked in the door to a dog. Aww, ouch, I am so glad Mr. Wink is okay. He’s a trooper. I want to give him snuggles. I agree with you – time doesn’t always work when it comes to dogs and cats becoming buds. You made the right decision for your family, which includes the two cats. There’s another family out there that is meant for Mae…hopefully one that doesn’t have cats. And let’s see – Penny the Golden Retriever currently has pancreatitis, so hello $300 vet bill (luckily we caught it early and she’ll be fine). And, uhm, here’s a gross one: one time she swallowed a sewing needle and that thing somehow did not destroy her throat or insides on its way…out. @aly, A SEWING NEEDLE? Oh my. I just, I can’t even. Yuppppp. Bringing it up is a real quick way to bring a conversation to an abrupt halt/potentially lose friends. Not my pet, but my friend was told his dog was depressed and needed a vaginoplasty. He responded that he wouldn’t pay for one for his wife, why would he pay for one for his lab? The current one is amazing. We’re not getting another pet after this. Ever. When I was a kid, my cat came home after an ice storm with a perfect puncture wound in her abdomen. Perfect as in no rough edges, no organ damage, no blood. We had a porthole to her guts. The vet was amazed. She healed with a week’s rest. No medication. Last year, right around 20 years later, my current cat came home with a close replica of the former cat’s wound. I was floored when she came in like nothing was wrong. As for strange injuries, it’s not really an injury, but more of a strange thing we have to deal with. We have a lot of pets and 2 of them are rats. Somehow as our rats have aged, their teeth grow crazy and we have to trim them every week. Super fun. And they love it. @Cathy, You, trim rats’ teeth? I hope you work that into random conversation because it’s amazing. Poor Wink! About 3 years ago my George came inside from his morning patrol with major bite wounds – one punctured down to his skull and one clean through his cheek. It was AWFUL. I had to irrigate the wounds and force antibiotics down his throat. He’s not an outdoor kitty anymore. @annettek, Oh man, when my cats have to have antibiotics I toss down the extra $30 for the shot rather than shoving antibiotics down anyone’s throat. Poor George. I had a cat that was an outside cat when I was little (we lived basically on a farm). One day we came home and found what looked like she’d been shot with a BB gun at the elbow joint of her back leg. Took her to the vet and her leg was broken. They cast it without asking and my dad was NOT happy about that vet bill because he would rather put the cat down. We never did figure out how she broke it and sadly our stupid fast driving neighbors hit her one day not too long after. Our story is called ‘the Christmas of Carnage.’ We had two cats, bought a house, got a rescue Dalmatian mix and the cats retreated to the safety of the basement. We brought the dog to my mom’s for Christmas and told her to keep her cat in her room and all would be well. After church on Christmas Eve, my mom let the dog into her room, thinking the cat was safe under the bed…and then the chase you just described happened. Dog caught cat by the belly, cat scratched and sprayed, it was chaos! My husband dragged the dog off and the cat went to the vet (yeah, emergency holiday visit!) thanks to a “protective belly fat layer,” kitty was fine. The dog eventually went back to the shelter to find a good family with kids and room to run. You just have to make the hard choices at times. Dogs and cats can live together, but not in my house! Tell Cody I’m sorry. My husband can relate. @Alisa, Oy, I’m so glad ours didn’t all go down around a major holiday or event. Oof. Really appreciate your perspectives. Not really weird, but a warning about bully sticks aka steer pizzle. Well-intentioned gift from a friend, but my 5 llb Chi swallowed the last bit and it blocked her esophagus?intestine? She expanded and panted uncontrollably, thank God my vet opens at 7 a.m. $1200 later for tracing fluids and pumping..diagnosis was death w/in an hour had I left for work. Lesson is no animal products for small dogs. On the flip side, I am so sorry to read of your experience; mine was just the opposite; our 16 lb amazing rescue cat totally embraced not only the 1st, but another Chi puppy later. they all groomed ears, snuggled by the FP, laid in the same sunray.And Maui kitty was declawed. Amazing..so I’ve never known dogs and cats not to be friends.Don’t give up on a future relationship..there is a future where no one chases the other :with the right rescue . I adopted Maui @ 6 mos and first dog was intro’d at 8 years..so there is hope for cats who have not lived with dogs. @Heather, I appreciate your optimism, I’m pretty sure we’re going to stick to being cat people. My pup ate the back side of a bra–she stopped when she got to the cups because of that darn tricky underwire. But, because she ate so much lycra/spandex along with the hook/eye closures she had to have it surgically removed. That cost about $800… She has an awesome scar now and the whole situation seems to have “cured” her from chewing stuff. My childhood dog, yellow lab, chewed the brake line on my dad’s truck. Luckily he wasn’t going fast when pulling it into the garage or we may have lost a kitchen. She also chewed through the line for the electric fence…after digging it up. The list of randomness goes on and on. We renamed her Million Dollar Dog. Strangely enough, she was never injured from any of it. Ended up dying at the old age of 13. Hugs to Winks! My 15th bday present was a shih tzu who developed a appetitite for mushrooms,the kind that grow in your yard. He ate them so many times it eventually caused him to have a seizure, sent him on a week long vet visit that cost $1000′s, and the end result was he became blind and deaf. He got around just fine and was the best lap dog. Glad Winks is going to be ok! @Amber, That’s almost like having a dog allergic to grass depending on where you live, mushrooms GALORE around these parts. I’m constantly kicking mushrooms over. And yes, my shih tzu now has allergies to grass…fun times giving him shots. Poor Wink, I love him! I have two cats, both rescues. One was abused as a kitten- legs duct taped and then spray painted. He is dumb and sweet as anything. He was trying to jump onto our kitchen bar and we had a wire shelf under it. He missed and landed on the shelf and got his leg stuck in between the wires. The howling, oh my goodness. I insisted we take him to the emergency vet (totally could have waited). He was fine, just sprained it. I love my pets so much it’s stupid too. We’ve also had dogs do weird things, one ate an iPod and when I was growing up we had another dog chew through the HVAC wires outside. She also ate wood paneling off the wall in our laundry room. @Ashley, I just, duct taped and spray painted? Ohhhh. Dogs are weird. This is further proof. Man, I love cats. I just want to bury my face and nuzzle their soft little furry necks as they purr gently in my ear. That’s the best feeling… unless you’re allergic and unless it sends you into anaphylactic shock. I really miss cats. Poor Wink. My brother bought a hairless cat. He sort of looks like a mix of a gargoyle and a newborn baby. Not as cuddly though. What a shame. @Stefanie, Cats in the sunshine. My childhood cat, Lucas got thrown by a dog who caught him around his middle (17 stitches), got bit on his paw (9 stitches) by a shrew (or some other small wild rodent type thing), licked a flashing that was thrown down during a roof repair and ended up with a snake tongue. He was 10 when he finally had to be put down – he got feline leukemia. We ‘gasp’ bought a pure-bred Maltese, Zeus, in 2004 who has a sensitive digestive system. Thankfully he is NOT a chewer but after heavy rains one year he ended up getting very sick – the vet thinks it was chemical run off from the rain. Anyway – blood poured from his heiny – It was SO SCARY!! He spent most of the week at the vet, countless meds, $1500 later – he was home. He is 9 now and lovely as ever – though missing some teeth due to age. Now I also have Titan, my border terrier mix rescue. His nickname is Hoover. He chews anything that is on the floor. He is part billy goat and part cat – he can jump the length of my king size bed to sleep on the back of the chair and has a good 5 foot vertical jump! He had a middle of the night on a Saturday, trip to the emergency vet (thank goodness we are only 15 minutes from the emergency vet on the west side) for x-rays. He had eaten some Lego’s, the stuffing from a stuffed animal and then some clay my daughter had been crafting with. The clay got lodged and he was hacking and choking. He threw most of it and the rest passed naturally. $300. So over the winter I had to put my 14 year old cat Lexi to sleep. He was just an ordinarily large tabby cat. He ate, slept, and pooped…That was about it. My husband, bless his heart said I haven’t been the same since he’s been gone. SO last week we adopted Mercury – I had been visiting this gray tabby at the Humane Society for three weeks and he likes me!! He would growl at some of the volunteers who had to feed him and would only let 1 person in particular change his litter. So every time I visited he would purr and let me hold him. He saw my dogs last week and hissed and got all fluffy tailed. But everyday he is getting better and better about the dogs. They sometimes even sleep in the same room!! No more hissing and my dogs are not cat chasers – thankfully. I am e-mailing you pics per your request. @REK981, Thank you for sending me the pictures! Mercury is my favorite (don’t tell Titan or Zeus) he’s super handsome. He might be my favorite too but we won’t tell. Did they test Mae for her prey drive before they let you take her home? Some dogs (and dog breeds) just aren’t good with cats because they are bred to hunt and they see the cats as prey. GSPs are hunting dogs, so that may have been part of the problem. Now that the cats have experienced that, though, they will probably be sketchy around dogs forever. I know the Humane Society of Hamilton County lists on their website whether a dog is good with cats and kids over (or under) a certain age. They will even let you bring in hour cats to test them with the dog you’re interested in. Just in case you ever decide to try again and don’t have your hearts set on a specific breed. My dogs have so far not had any weird injuries (thank goodness), except for the one time that Charlie face planted on the porch out back and skinned his chin all up. That was fun. And bloody. But Copper likes to eat the fleece blankets we put in their crates and then he carries around the smaller pieces like they’re his lovies. Let’s just say there are lots of colorful bits of fleece floating around our backyard. Crazy dogs. @Katie, They did, or at least they say they did. Which makes me sad because they clearly didn’t. I don’t think the future holds dogs for us. Even if they do have woobies. Our cat, Pippin, ate an 18 inch piece of embrodery thread when he was about eight weeks old (he was resuced by us at 10 days old when his mother died). $500 dollars and one stomach surgery later he was back to perfect health. He’s now seven years old…and we still have the string that the vet was nice enough to give us after she removed it from his stomach! A former room mate of mine used to do beadwork with fishing line as the base of her projects. My beloved grumpy pants cat (who wasn’t quite 2 years old at the time) ate one of the scrap pieces she’d left laying around (despite my please to put it away). Bloody scoot marks across our carpet as he’d tried and failed to remove the partially digest line had me in a panic; an emergency overnight stay at the vet and a 1200$ bill to have him sedated, and the line surgically removed, and 2 weeks of antibiotics to be sure he’d be ok. The grump is now nearly 9 and still going strong, though he now despises the vets who saved him. @kai, Hoooooly cow. I really want to ask my lawsband about suing for damages…lawyers ruin everything. @Casey, I hadn’t even thought about that really – we were both just out of our teens really and the consequences hadn’t registered. And lawyers make wreck everything, but you’ll never have to worry about being taken in a scam – to smart for that. When I was little, some sociopathic kid in our neighborhood shot our cat with a BB gun. We thought he was ok, but it was weird that for days he was dragging his tail on the ground behind him. My mom took him to the vet for an X-ray, and it turned out the BB had shattered one of the vertebrae in his tail. If it had been 2 vertebrae higher, he would’ve been paralyzed. 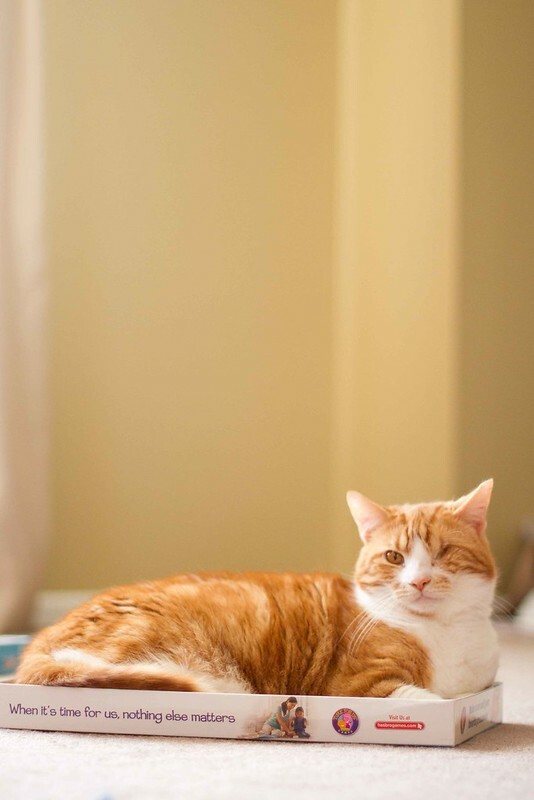 Instead he just had to have his tail surgically amputated, and he lived out the rest of his days with people asking if he was part Manx because of the little stump where his tail should’ve been. @cindy w, Wink wags his tail, if someone broke his wagging tail THEY WOULD BE ENDED. Poor, poor Wink. I know lots of people probably gave you grief for returning Mae, but I applaud you for putting your Wink’s survival first. It must have been a really, really hard decision, but obviously that would have been too stressful for your whole family. Thankfully I don’t have any pet injury stories, other than the meter reader macing my corgi mix because he was loose in the yard when the guy came over. Some wet washcloths got the stinging out. @Laura W., he maced your dog?! Oh, I would have had his job. @Laura W., If someone has something terrible to say about returning the dog I will show them the ONE EYED CAT who lived at the shelter for 6+ months because no one wanted him because he was creepy looking. I sleep super well at night. Did you inquire if the dog had been tested with other animals- dogs, cats and children- before adopting? And requesting seeing that interaction? That’s a standard at all rescues/shelters and seems as if was not done. A shame for all involved- the cat and the dog. People just need to do more research and be more thorough before adding to their family of pets- rescues are wonderful- but like anything- you have to be a smart “consumer”. You wouldn’t just pick any car b/c it’s cute. You have to make sure it works with your current situation. I hope Mae finds a loving forever home. good luck with your cat too. @Koko, They said it was done, but clearly it was not, or at least not done properly. I wasn’t with my husband when he picked up the dog otherwise I would have put up more of a stink. We didn’t choose the dog because it was cute, Cody grew up with the breed and all were well trained with cats. @Casey, how awful. Clearly they just thought- ah, they’ll make it work. Ugh, some people shouldn’t be in the rescue arena b/c they do more harm than good- literal & figurative. I know people think- great dog/cat- nothing bad can happen…. Sure. My now in laws once told me that when they arrived on our door step (surprise!) w/ their dog (hubs & I only newly engaged) for visit & swore good w/ other dogs…. 8 hrs later my poor pup is getting 30 staples to close her throat & 18 her cheek thanks to their friendly pup….. Okay, I loved that story. Poor Wink. I’m really sorry. I’m SO glad he’s okay. Roozle is too, as I told her the story earlier this week. She loves the Wink photos I show her from Instagram. When Roozle was one, I was in our bedroom and noticed that something was wrong with our cat, Patrick. As I looked closer, I freaked out, realizing that part of his face was gone. Bloody. And gone. And he was acting fine. We quickly rushed him to the vet, telling her that he ABSOLUTELY wasn’t like that the day before. She assured us that it absolutely was and that while we were paying such careful attention to our little Roozle, our cat had a tooth infection that BUSTED THROUGH HIS FACE. Seriously. He even had gangrene from it. Omg. Worst cat parents ever. They had to take out all his teeth on that side and find a way to sew his face back together. He then wore a cone on his neck for 2 months and healed with a giant scar across his whole face. My neighbor calls him “Sandwich Mouth.” He’s totally fine. He picked up a bit of anxiety from the whole thing and now licks his fur too much (WOULDN’T YOU?! ), but otherwise is totally fine. Well, to be fair I didn’t notice my cat had TORN OFF A TOE. Our cat has lost a back toe, too. He snuck out one night and came back a couple days later with a limp and a swollen foot. We got him looked at and loaded up with anti-biotics, but it didn’t go away. Then his toe *exploded* all over the bathroom, where we’d been keeping him while he recuperated, and there was exposed bone, and the vet had to cut it off. I nearly hurled. Once it was off, though, he was feeling much more the thing and back to his usual ways. I hope Wink feels better soon, too. My dog Maddie is a rescue pup that came straight from a very bad situation. She’s just the sweetest thing ever and she thinks she’s part cat. I think it helped that we socialized her with the cats from the time we got her, and she was still young she was around 5 months old our vet estimated. Our worst pet injury (so far) is when our poor black cat, Jinx, got shot by a bb gun. I thought for sure she was going to die, thankfully she pulled through. Also two of the cats, we have four (I know, crazy cat lady) were fighting and Bear cut Chloe in the ear and there was SO much blood!! My husband cannot stand the sight of blood so it was up to me to clean up the kitchen, the bathroom, the hall, under the cabinets. Basically everywhere she ran shaking her head. UGH! @KaraB, You say crazy cat lady, I say exactly what I aspire to becoming. When I was younger, we had an inside/outside cat named Mikey. One day I heard a pitiful mew from the back door. Mikey was on the back porch in a box – with a compound fracture in one hind leg. I figured he had either been hit by a car or someone had hit him – maybe with a baseball bat or something. The vet tried to fix it, but after a couple of weeks Mikey lost the cast (it got caught on something), and the vet said the leg had to be amputated. Mikey became a tripod. I still say that even through the decision was hard, you did the right thing by returning Mae. The new pet has to fit in with the current family dynamics, and from what I read, she only tolerated Cody when nobody else was available (I got the impression she might be afraid of men). She deserves a home where there are the types of people she can tolerate, and not the temptation/distraction of “edible” co-pets. I had a kitty swallow an embroidery needle once. He was playing with the floss on the end and before I knew it he had swallowed the whole thing! After the surgery the vet wanted to know if I wanted the needle back. After all, it cost about 800.00 to get it back. I politely declined though. YUCK!! Oh the stories I can tell you about the elderly wonder aka my black lab, Sam. How Sam has lived to be 15 and counting is beyond understanding. Her most famous “injury” is the one I still can’t figure out. I quilt. And I used to have a pincushion that looked something like an apple or a tomato with a strawberry attached. It was loaded, of course, with quilt pins – multicolored ball top. I always put my sewing supplies away in the same place — out of Sam’s reach. Anyway, I woke up one morning and saw a scrap of red fabric on the floor; my current quilt was purple, but I wasn’t alarmed or anything until I got my glasses on and saw more red pieces and what looked to be saw dust. I rounded the corner to the living room — more saw dust and lots of red fabric. And then it dawned on me that I didn’t see any pins. Off to the vet we went. He sent me back home to try to figure out how many pins she might have eaten while he x-rayed and set up for surgery. I’d been home maybe ten minutes when he called me and told me to “come on back” because he wanted to show me something (I could have walked to his office if I wanted to; it was that close to my house). In the x-ray the little balls from the pin tops showed up. No pins. Not one. So while waiting for her to come out of the sedation I went back home to figure it out. There were headless pins all over my floor. The danged dog literally bit the pin heads off the pins and then spit the pins out. She pooped pin heads for weeks. And that was a couple of hundred dollars I’ll never get back. My dachshund climbed into a laundry basket of clean, warm, folded clothes. I must have startled him when I told him to get out, that he caught his back toenail on one of the holes in the basket. Ripped right off, much like your cat. Blood everywhere. But I guess with dogs, their nails grow back. Or in this case, he really just ripped it down to the nub. He’s fine now. But the yelp he made when it ripped off…broke my heart into teeny tiny pieces. This isn’t an injury really, but an ER vet story. I have a beloved Beagle who wandered up to our house 4 years ago and adopted us. Maisy Mouse is definitely my dog and follows me everywhere I go in the house. One night I realized she wasn’t on the bed with me and didn’t come when I called her. I found her in the kitchen standing over a (previously unopened) 5 pound bag of Hershey kisses. The bag was empty. She was blimp-like. I rushed her to the vet (it was, of course, after hours) and they pumped her stomach, etc. She was fine but the funny moment came when I was filling out the paperwork. The receptionist asked me what happened. When I told her, she asked me if Maisy Mouse had eaten the wrappers too. Um, no, lady. She unwrapped each one before she ate them whole. WOW. That was a $500 visit. I was just going to make a funny remark on Twitter about how Amazon had sent me an email trying to sell me dog harnesses – I think because I clicked on a link you tweeted about them – but I thought I’d check in to see how things had gone before I was grossly insensitive. I’m sorry about poor Wink! And Mae, too, but what can be done? I hope Mae finds a cat-free home, and I am so glad Wink is on the mend. Poor kitty. So you mentioned crystals in your cat’s bloody urine, did your vet give you the diagnosis of Cystitis? I’m just curious if he has the same thing as my cat and what the vet recommended you do about it. My cat started having bloody urine and peeing all over the house ten weeks ago when we brought home our baby from the hospital and it still hasn’t gone away. The vet says we can only give pain killers, very expensive, and they don’t even work. Just wondering how you’re handling the whole thing and if Wink just got better after the dog left or if your vet gave you a better action plan. So sad for you that the dog thing didn’t work out, we love our rescue dog and our rescue cats but gosh they sure do come with their own kind of baggage. I love all your cat posts (and photography ones, seriously just upgraded to the 7D per your recommendation from the Epic One About Buying Cameras and Lenses and I couldn’t be happier with my photographs of my new little baby). You’re great– and happy happy birthday. @Tricia, I don’t remember what the exact diagnosis was but the treatment was a medication that kept his pee hole from spasming as he did his business as well as a pain shot that lasted a week, a switch to a fancy water fountain (so he’d want to drink more water) as well as a food change for bladder health (Science Diet C/D I believe?) He’s doing much better, hopefully that’s the case for you as well and your vet just doesn’t know what they’re talking about. Did they do a urine sample? That’s what went down with Winker, and there were a lot of really big crystals. Womp. 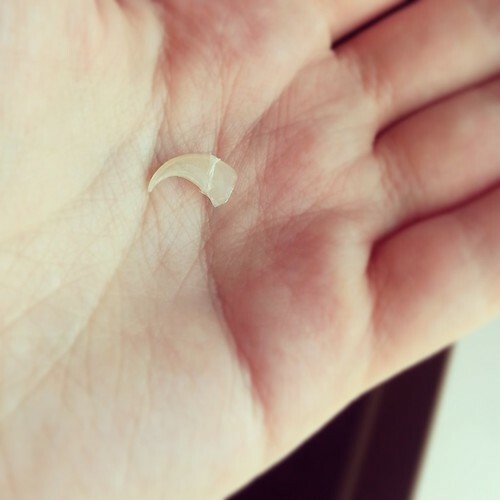 How strange, Dollar’s toenail was ripped out about a month ago. It’s also scabbing over… I guess it doesn’t grow back? Glad your cat is okay. It’s a really scary thing!